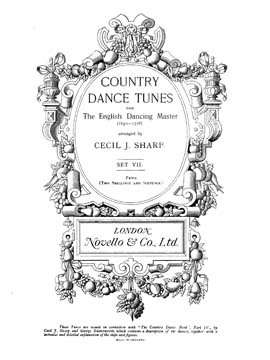 This page is devoted to Cecil Sharp's original piano arrangements of English country dance and Morris tunes from Playford's The English Dancing Master. Also included are Sharp's "Notes To Musicians". We have scanned into PDF format original editions of Cecil Sharp's publications printed in 1912. Some tunes may be in keys other than what is currently popular. I am working on scanning more editions in our possession but request donations to purchase originals that we do not have. Any donations can be sent to: Mickie Zekley - PO Box 1176 - Mendocino, CA 95460 email Mickie Zekley If anyone has original editions we would appreciate their loan, donation or good scans of the originals to continue this project. More to come when I have time. - Check back soon. Special thanks to Jon Berger for loan of his set of original Morris Dance Tune books. Thanks to Alesea Messal for loan of her originals.